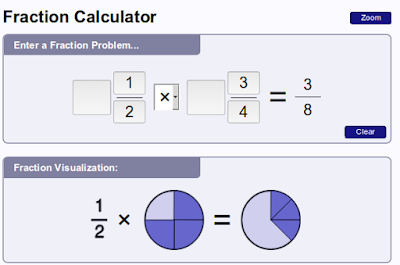 This tool allows you to VISUALIZE fraction multiplication ...and other fraction operations, but I think it's especially useful for fraction multiplication. 1/2 × 3/4 can be seen as HALF of 3/4... which is 3/8. Or, 5/6 × 1 1/2 can be thought of as 5/6 OF 1 1/2 , which is 1 1/4. You see, 1/2 × 3/4 can be written as 50% of 3/4 = 50% × 3/4 = 0.5 × 3/4 = 0.5 × 0.25. Or, 5/6 × 1 1/2 becomes (about) 83% of 1 1/2. Or maybe you turn it around and get 1 1/2 × 5/6 = 150% of 5/6. Being able to think FLEXIBLY of fractions/decimals/percentages really helps you (and your students) find all kinds of tie-ins with real-world situations. Make It Real Learning products are back at MathMammoth.com! Make It Real Learning workbooks each concentrate answering the question, "When am I ever going to use this?" The workbooks contain activities or problem situations taken from real-life, with real data. Some examples of the situations are: cell phone plans, autism, population growth, cooking, borrowing money, credit cards, life spans, music downloads, etc. etc. As students work through the problems, they can use the math skills and concepts they have learned in their math curriculum (such as the concept of average or graphing), and apply those to a situation from real-life. 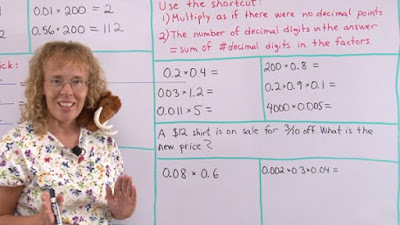 Decimals, decimals, decimals... math curricula spend a LOT of time with decimals in grades 4-6. And yes, a lot of it is necessary. But perhaps your child can grasp the concepts quicker with these videos, and then be able to progress faster and easier. Decimal division in particular can be a stumbling block. So, check out my new videos and bookmark the page for later use! See for example factors of 72, And all the factors of this large number. 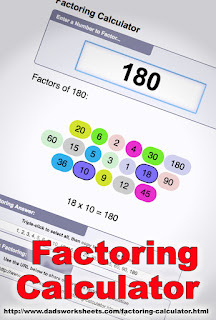 Personally, I think it could be improved by listing the factors in order from 1 to the number itself, so that the pairing will then show how the largest and the smallest factors are paired, then the 2nd largest with the 2nd smallest, and so on. Neat anyway! Here's a REALLY NEAT collection of interactive activities & games for basic probability concepts. Great for middle school! For example, you get to experiment what happens to the probability distribution when a die is biased. Just roll the die 100s or 1000s of times at one push of a button and see the distribution. In another activity you need to figure out IF a die is biased or not. Then the collection includes games that are based on the probabilities of obtaining different sums or differences with two dice. Or, you get to fix a match box machine that is producing too much variation in the number of matches per box. First you take lots of samples and analyze the situation using boxplots, and then you adjust the machine. That's how things are actually done in real-life quality control. 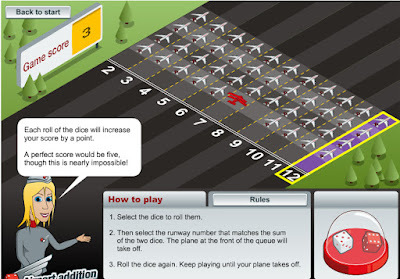 Here's the link again: Interactive probability games. Check it out! 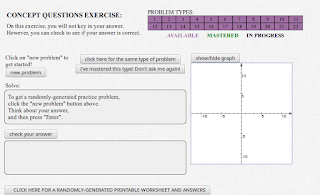 I stumbled upon a site that has a complete ALGEBRA 1 curriculum with interactive online exercises - all free! 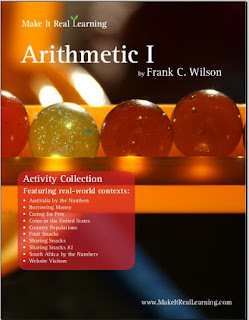 I also added that link to my page that lists video websites and online curricula for algebra 1. I highly recommend you take a look at some of the sites with VIDEOS for your high school students! 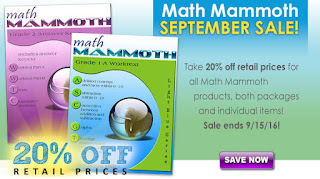 Math Mammoth printed books are on sale at Rainbow Resource Center! Get them now at 20% off! The sale lasts till September 15.